This year, the National Council for Social Studies had its annual conference in Facing History's home town of Boston. Teachers from around the country flew in - including many Facing History teachers who presented, attended sessions, and stopped by the booth. I got to go too! DOCUMENTED - the film about Jose Antonio Vargas coming out about not having legal papers for US residency. NICHOLAS KRISTOF - who, with his wife Sheryl WuDunn, has created the upcoming series, "A Path Appears" to highlight that action in the face of injustice IS possible. REDESIGNING CIVIC EDUCATION IN A DIGITAL AGE - a session that left me with more questions than answers around the theme of how civic engagement is changing. That's good, right? FACING HISTORY AND OURSELVES - yes, us! With this conference in our backyard, there were so many staff members and teachers involved and new resources highlighted. In the goal of keeping the inspiration flowing, I wanted to share a few highlights, starting with keynote speaker and Facing History friend, Pulitzer Prize-winning journalist Nicholas Kristof. I could watch Eunice every day! In high school, Jose came to the realizations both that he is gay and that he was undocumented. "I couldn't be in the closet about two things at once," he shared with us in his address, "and it was easier to come out about being gay." One of the campaigns Jose's work has led to, is an effort to spark conversation about how we define "American." How DO we define "American" in our daily walk and conversation? How/where did you learn about civic life? Did it prepare you to engage civically today? These were some of the questions posed to us in a session with Mills College, University of Chicago, and Project Zero/Harvard University faculty, exploring "Redesigning Civic Education in a Digital Age." How do we, today, educate our students for "participatory politics"? Many of the core practices - investigation, dialogue, mobilization - are not new, but the way we can do them have changed in a digital age, and in many cases our students are leading this exploration of new methods of participation. 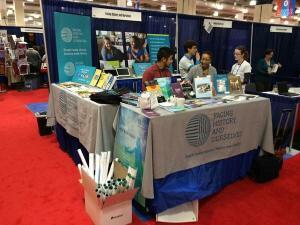 Facing History was able to highlight many of our new resources during the conference to packed rooms! Teaching To Kill a Mockingbird raised high interest - and will probably get some of the Social Studies teachers new friends in their English departments since posters were available at the Facing History booth. Click here for the guide and information about upcoming workshops online and face-to-face. Exploring the fragility of democracy and the legacy of "race" through the post-Civil War Reconstruction Era? We have a guide for that coming out, too! Right now the best way to explore it is to come to a workshop. Click here for Southern California's workshop in March. We've also just published a book about the Nanjing Atrocities during World War II. The anniversary of the start of these atrocities is December 13th. Click here to learn more. I could keep going with Ken Burns and his comment that he "wakes the dead" for a living, thereby bringing history to life for us, the grandson of Cesar Chavez sharing that he knew Cesar first as his "goofy grandfather" before being inspired by his activism, the descendant of Frederick Douglass trying to convince fellow students that he was not making stories up when he shared his family tree at school, and so many teachers sharing great ideas all the way through. Michelle Herczog, our very own LA County Office of Education History-Social Science guru, deserves a special shout-out as the President of NCSS who led the effort to put all of this together. A great gift to be inspired going into the Winter Break!